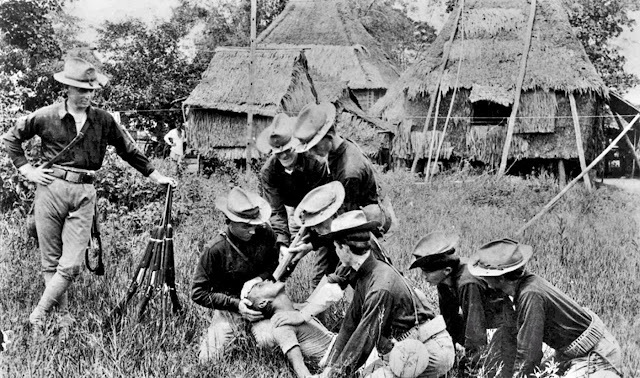 American soldiers administer the water cure to a Filipino during the Fil-Am War. Image source: PRI, originally from the US National Archives. From a letter1 by a Private Andrew K. Weir of the United States Volunteers’ Fourth Cavalry to his uncle, written in Balayan, Batangas on the 10th of April 1901, we get the gory details about the methods of torture employed by American soldiers against Filipinos during the Philippine-American War. The young Filipino was also whipped and clubbed mercilessly until eventually he agreed to show the Americans where the supposedly stolen money was. Weir realized that the prisoner did not really know where the money was and that he only agreed to do so to get the torture stopped. Mortified, he saw Arnold privately to get the water treatment stopped, only to be threatened with insubordination. But Weir was unfazed and told his superior that if the water treatment was stopped, he would no longer report the incident. Arnold agreed and promised not to have anyone tortured again. Earlier in Pasay, as Weir confronted Arnold, the latter was supposed to have said, “…these people have no feelings other than physical and should not be treated as human beings.” Because of his bigoted opinion of Filipinos, Arnold was, of course, totally unaware that he was in his treatment of prisoners and his preference for the use of torture to extract in formation in truth the one who was behaving like a savage. West, in investigating the charges filed by Weir, in fact wrote in a letter addressed to the Adjutant General of the Department of Northern Luzon that he had found witnesses who had corroborated Weir’s story. As already mentioned, however, there was no real evidence that suggested that the United States Army pursued the case to its natural conclusion: a court martial for the offending soldiers. 1 The letter was part of a document entitled “Mr. Root Must Go,” which contained documents about efforts to have Mr. Elihu Root, United States Secretary of War during the Philippine-American War, dismissed from office on account of reports of anomalous behavior by American soldiers assigned in the Philippines at the time. Online at Hathi Trust Digital Library. 2 “America in the Philippines, 1899-1902: the First Torture Scandal,” by Christopher J. Einolf, published 2014.